However, the top of the valence band and the bottom of the conduction band are not generally at the same value of the electron momentum. 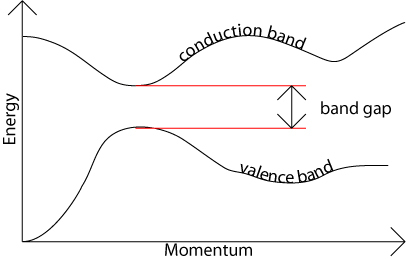 In a direct band gap semiconductor, the top of the valence band and the bottom of the conduction band occur at the same value of momentum, as in the schematic below. When an electron sitting at the bottom of the Conduction Band recombines with a hole sitting at the top of the Valance Band, there will be no change in momentum values. Energy is conserved by means of emitting a photon, such transitions are called as radiative transitions. Direct band gap semiconductors are capable of photon emission, by radiative recombination,but indirect semiconductors have a low probability of radiative recombination. 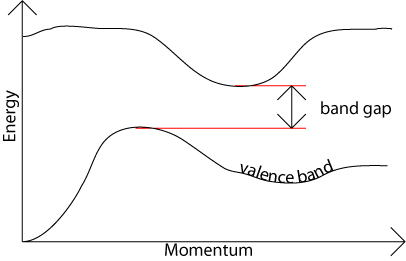 In an indirect band gap semiconductor, the maximum energy of the valence band occurs at a different value of momentum when comparing with the minimum in the conduction band. For an indirect-band gap material; the minimum of the CB and maximum of the VB lie at different k-values. When an e- and hole recombine in an indirect-band gap s/c, phonons must be involved to conserve momentum. In indirect band gap semiconductors may have iso electronic impurity states or Defect state which are direct, and therefore the recombination from these states may also be radiative. Atoms vibrate about their mean position at a finite temperature.These vibrations produce vibrational waves inside the crystal. Phonons are the quanta of these vibrational waves. Phonons travel with a velocity of sound . Their wavelength is determined by the crystal lattice constant. Phonons can only exist inside the crystal.